Hanoi (VNA) - Deputy Prime Minister Vuong Dinh Hue has released a list of State-owned enterprises from which the Vietnam Oil and Gas Group (PetroVietnam) must reduce its ownership between 2017 and 2020. By 2020, PetroVietnam must reduce its stakes in the following three companies to at least 51 percent, including PetroVietnam Fertiliser and Chemicals Corporation (DPM), PetroVietnam Ca Mau Fertiliser JSC (DCM) and PetroVietnam Gas JSC. More specifically, PetroVietnam must reduce its stakes in DPM and DCM to 51 percent each from the current 61.3 percent and 75.5 percent, respectively, by the end of 2018. The State-owned oil and gas group must sell shares to cut its ownership from nearly 97 percent to 65 percent in PetroVietnam Gas Joint Stock Company between 2018 and 2019. PetroVietnam must lower its share percentage in PetroVietnam Transportation Corporation to 36 percent from the current 51 percent if it successfully reaches an agreement with CitiBank to amend the previous deal on PetroVietnam’s ownership signed between the two companies. The other three companies in which PetroVietnam must reduce its ownership to below 50 percent of charter capital are PetroVietnam Oil Corporation (PV Oil), Binh Son Refining and Petrochemical Co Ltd (BSR) and PetroVietnam Power Corporation (PV Power). PetroVietnam currently owns 100 percent stakes in PV Oil and BSR while its ownership of 51 percent in PV Power would end by 2019. PVN could offload its stakes in those companies sooner if the group reaches agreements with the banks that are its partners in those firms. 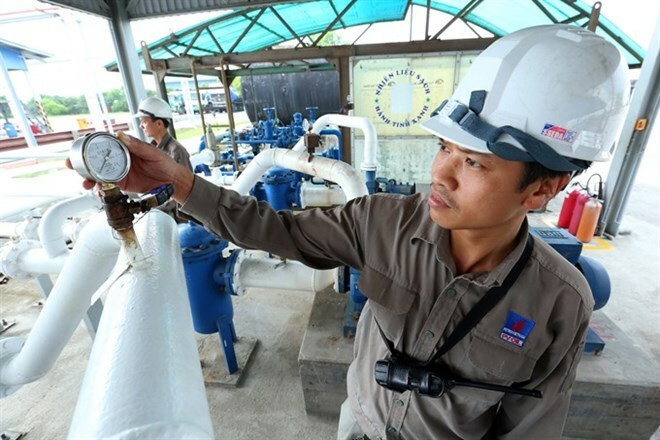 By 2018 and 2019, PetroVietnam must sell the entirety of its shares in companies such as PetroVietnam Insurance Corporation (PVI), PetroVietnam Construction Corporation (PVC) and PetroVietnam Maintenance and Repair Corporation. The ownership percentages that PetroVietnam holds in these four companies are 35 percent, 54.5 percent and 41 percent, respectively. In addition, PetroVietnam will have to wait for the Prime Minister’s decisions on its divestment in PetroVietnam Petrochemical and Textile Fiber Company (PVTex) and Dung Quat Ship Building Industry Co Ltd, in which PetroVietnam holds 74 percent and 100 percent of charter capital. The Deputy PM also asked PetroVietnam to maintain its current ownership in other subsidiaries and associate companies such as PetroVietnam Technical Services Corporation, the Vietnam-Russia joint venture Vietsovpetro and PetroVietnam Drilling and Well Services Corporation. PetroVietnam’s shares in those three companies are 51.4 percent, 51 percent and 50.4 percent, respectively.